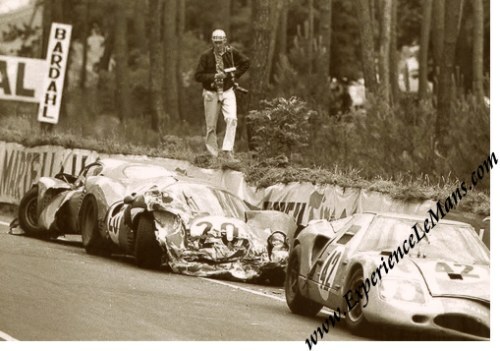 1966 photo of Ferrari 330 P3 S/N 0848 Matra M620 BRM and CD SP66 Peugeot all crashed at Le Mans 24 Hours. This is a recent print from the 1966 negative of the Ferrari 330 P3 S/N 0848 of Mike Parkes and Ludovico Scarfiotti, the Matra M630 BRM S/N 03 of Jo Schlesser and Alan Rees and what looks to be the C.D. SP66 Peugeot of Georges Heligouin and Johnny Rives, all crashed at the same site during the 1966 running of the 24 Hours of Le Mans. The photo measures some 14.5 x 10 cm or 5.5 x 4 inches. The race was won by New-Zealanders Bruce McLaren and Chris Amon in their Shelby American entered Ford MKII (S/N 1046) with a total of 360 laps to their name. For the full results of this race, please see 24 Heures du Mans results 1966.